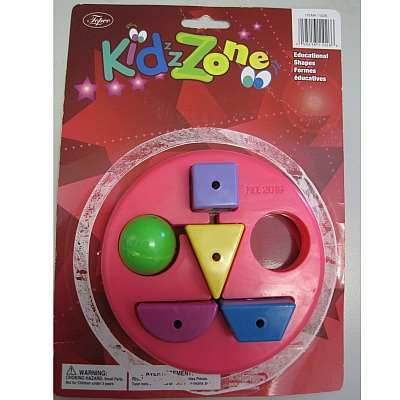 On April 28, 2011 Health Canada has recalled the Topco Kidz Zone Shape Sorter. This recall involves a shape sorter toy that includes a pink plastic circular disk with six cut-outs and five plastic shapes of various colors. The recalled toy can be identified by Topco item number 11026 and UPC 0-58216-11026-6. The pink disk has "No. 2019" printed on it. The ball shape and the cube shape are small pieces that pose a choking hazard to young children. At time of the recall Health Canada is aware of one complaint related to the shape sorter. No injuries were reported. The shape sorter toy should be kept safely out of the reach of children under three years of age, and older children if they still tend to put toys in their mouths. Alternatively, you can remove the ball shape and cube shape from the recalled toy set, and safely dispose of them in regular household garbage. Approximately 721 of the recalled toys were sold at various dollar stores in Canada. These recalled products were sold from December 2008 to February 2011. The shape sorters were manufactured in China. The toys were distributed by The Topco Group of Toronto, Ontario.